Virender Sehwag and Saurav Ganguly slammed contrasting centuries as India stormed into the semifinals of the Champions Trophy cricket tournament with a crushing eight-wicket victory over England in a crucial Group B league match here today. What a peformance by the Indian batting today! It was simply awesome as England’s target of 269 proved a cakewalk for India with centuries by Virender Sehwag and Saurav Ganguly as icing on the cake. Australia completed a 5-0 sweep over India today in the qualifying tie at the Memorial Drive here to enter the World Group stage of the Davis Cup tennis tournament. Marat Safin sent Russia into the Davis Cup final by beating David Nalbandian of Argentina 7-6, 6-7, 6-0, 6-3 in the first reverse singles of their semifinal today. Yet another name has been added to the long and unending list of national hockey stars who at the peak of their careers have been humiliated and unceremoniously shunted out. The latest victim is Baljit Singh Dhillon, who led the country in several tournaments, and last played in the World Cup at Kuala Lumpur. “The Indian hockey team is confident of defending the title in the forthcoming Asian Games and there is complete unity amongst the players.” Asserting this here today, the coach of the Busan- bound hockey team, Narinder Singh Sodhi, who was in the city on a day’s visit to call on his sister who underwent a surgery, said reports on dissensions in the team were baseless. Special Security Bureau, New Delhi, and Central Industrial Security Force notched up wins in contrasting style on the second day of the 32nd SN Vohra’s All-India Gurmit Memorial Hockey Tournament at the Sector 18 hockey stadium here today. BSF Jalandhar will meet Indian Air Force, Delhi, in the final of 11th All-India Baba Farid Gold Cup Hockey Tournament to be played here tomorrow. Both the teams won through penalty strokes. Scripting one of their most authoritative wins in international outings, Mohun Bagan crushed Sri Lanka’s Saunders Sports Club 5-1 to sail into the second round of the AFC Champions league here today. Bihar in the women’s section and Madhya Pradesh in the men’s section emerged as champions in the 12th Throwball Federation Cup Meet which concluded at the Guru Nanak Stadium here today. In the final Bihar managed to scrap past a fighting West Bengal 15-12, 16-14 to retain the title. In the men’s section, Madhya Pradesh proved their supremacy over Delhi 15-9, 15-10 to clinch the title. DAV School, Jalandhar, made a clean sweep to retain all the four (senior and junior boys and girls) team titles in the All-India Mahatma Hans Raj Tournament (Punjab Zone) which concluded at Guru Nanak Stadium here on Saturday. The Indian cricket team celebrates the dismissal of England's Marcus Trescothick, who failed to score during the pool match between India and England in the ICC Champions Trophy in Colombo, Sri Lanka, on Sunday. Sehwag blasted 21 fours and one six in a blazing career- best score of 126 off just 104 balls which very nearly eclipsed Ganguly’s knock of 117 not out. India overtook England’s score of 269 for seven with more than 10 overs to spare and set up a semifinal clash with group C winners South Africa on September 25. 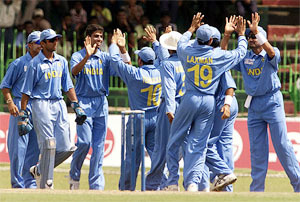 Sehwag and Ganguly put up 192 runs for the opening wicket in just 28 overs, reducing a keenly-awaited match into a virtual no-contest. England, who elected to bat after captain Nasser Hussain won the toss, survived a nightmarish start to post a decent total, thanks mainly to Ian Blackwell, who top-scored with 82.Blackwell, playing only his second one-dayer, led a middle-order resurgence that saw Ronnie Irani, Owais Shah and Alec Stewart chipping in with useful scores. But Sehwag and Ganguly made England score look highly inadequate. Ganguly, who was totally eclipsed by his partner during their opening wicket stand, came into his own towards the end of the innings. He brought up his 19th one-day hundred with a huge six off Blackwell and then smashed another six and four off Dominic Cork in the next over to take India to victory. Sehwag, whose only previous century in one-day cricket had also come in Sri Lanka, set the ground ablaze with some lusty hitting. He went after every bowler but Andrew Caddick bore the maximum brunt, his first spell of six overs costing England 49 runs. Ganguly on the other hand was struggling to find the gaps and reduced to a silent spectator as Sehwag blazed his way through to 50 in 37 balls and then 100 in 77 balls. Fall of wickets: 1-2, 2-7, 3-80, 4-127, 5-153, 6-257, 7-264. Bowling: Zaheer 10-2-40-0, Nehra 10-0-49-2, Kumble 9-0-58-2, Harbhajan 10-0-42-0, Ganguly 1-0-10-0, Tendulkar 2-0-13-1, Yuvraj 3-0-18-1, Sehwag 5-0-25-0. Fall of wickets: 1-192, 2-200. Most fittingly, India took their place in the semifinals with so much ease that they will be the favourites against South Africa on September 25. In the second semifinal on September 27 Sri Lanka will face Australia so the next week will see the best of cricket. When the Indians play like this, they are a joy to watch, playing like tigers. Most of the crowd which turned out today wanted India to win but who had thought they would do so with such brutality? I have been a fan of Virender Sehwag for some years now because when he started making news as a kid, I was very much part of the action. So many times we played together in the Delhi leagues and I have seen him demolish good bowling attacks . Today he was batting against England as if their bowlers were of the club level only. I tell you this Indian team can play like crazy on a given day. India were on top of England if you leave out about 15 of their last overs while batting. That was the time Alec Stewart and Ian Blackwell thrashed the Indian bowlers around the stadium. I was worried that the Indians had probably thrown away the advantage Ashish Nehra had given India with the two wickets he had picked up early on. But in the end, England would have been safe only if they had scored something like 360-380 runs going by the way Ganguly and Sehwag tore their bowlers apart. Sehwag’s batting was based on his timing and the courage to play big shots. England would rue the catch Nick Knight dropped when Sehwag was struggling in the opening overs as it proved very costly for them. Once he settled in Sehwag played some searing shots and all the English fielders could do was to run and fetch the ball. 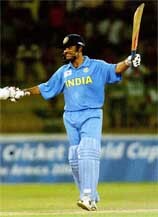 Ganguly was sensible in his batting. When Sehwag was on song, Ganguly played with caution and only when he knew India could not lose the match did he go for the big hits. India deserved to win today but now they have to keep playing like this for two more matches if they are to win the Champions Trophy. Sahara India group may return as sponsors of the Indian cricket team as negotiations were on to convince South African Airways to withdraw their objections to the use of the group’s logo in ICC tournaments. IMG, marketing agents of the cricket board, today said they were trying to revive the sponsorship by Sahara which had pulled out of a three-year deal following objections by International Cricket Council over the use of its logo during the ongoing Champions Trophy tournament. “We are still hopeful of a resolution with Sahara,” IMG chief Ravi Krishnan told PTI today. It was due to this hope that the IMG has still not officially informed the cricket board about Sahara’s decision to withdraw its multi-crore rupee sponsorship, Krishnan said. Sahara spokesman Sanjay Lal also did not rule out the possibility of the company’s comeback. “It (the return of Sahara as sponsors) is not impossible. But as of now it seems a tall order,” Lal said. The ICC’s objection to Sahara logo stemmed from the fact its airline business had a potential clash of interest with South African Airways, one of the official sponsors of Champions Trophy. Sahara India Pariwar, who recently pulled out of cricket sponsorship, lavished cash awards on Indian medal winners in the Commonwealth Games at an impressive function in the capital. 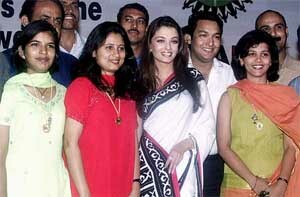 Film actress Aishwarya Rai, who has been inducted as a “Council Director” of Sahara India, gave away the cash awards, a gold medallion with a gold chain and a kit bag were presented to each of the medal winners and their coaches. The cash awards ranged from Rs 7,500 to Rs 30,000, which were given to the athletes on the basis of the medals won by them. They will get these amounts every month for a period of one year. In all, the medallists would receive Rs 1.54 crore. The awards were given in “recognition of the medal winners of the Commonwealth Games, and enhance their motivational levels, considering that the Asian Games is round the corner and the Olympic Games are not far off”. All the 69 medal winners of the Commonwealth Games were felicitated with cash awards. However weightlifters Krishnan Madasamy and Sateesha Rai, who also won medals, but were stripped of them for testing positive for banned substances, were not among those who were honoured. The coaches of the sportspersons were also honoured with cash awards. Barring a few exceptions like athletes Bobby George and Neelam J. Singh, most of the other Commonwealth Games medallists were present in person to receive the awards. Among them were shooters Jaspal Rana, Anajali Vedpathak, Abhinav Bindra, their coach Prof Sunny Thomas, weightliftes Kunjarani Devi, Sanamacha Chanu, Thandava Muthu, badminton player Aparna Popat and the women’s hockey team. Australia rounded off their performance against the Indians winning both the reverse singles matches which were reduced to dead rubbers since they had already taken an unbeatable 3-0 lead. Scott Draper had little difficulty in putting away Rohan Bopanna, who came in for Leander Paes, 6-3 7-5, but Wayne Arthurs had a match on his hands as Harsh Mankad pushed the match to its limit before going down 4-6 6-3 5-7 in 98 minutes. Before the hosts could begin their party Mankad, who was overwhelmed by world No. 1 Lleyton Hewitt in his first match on Friday, occupied a few brief moments of glory, playing some refreshing tennis that belied his world ranking of 831. “I thought I played some good tennis. 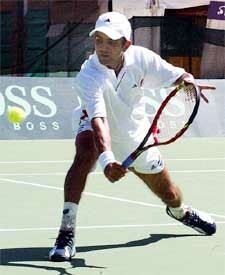 It was more of my style, mixing volleys and serves,” he said. “I am happy I could give something to cheer about for the fans. Arthurs, against whom the Indians managed to win the only two sets they did in the whole encounter, conceded he was nervous against Mankad. “Yes, I was a bit nervous. He came out of his shoes and gave a scare,” he said. Probably the fact that there was no pressure like day one helped Mankad. He showed no signs of nerves, and one could see, particularly in the second and third sets, the Adelaide weather had replaced a bit of his natural suavity with an ounce of typical Aussie grit. After dropping serve in the fifth game of the first set, Mankad put up a stiffer resistance in the second as he went on the overdrive. Arthurs, by the way, is too soft a chap to be considered Australian, and for once, it was the 22-year old Indian who was forcing him to come out of his shell as he took the second set. But Mankad’s short and happy life at the court soon came to an end, for Arthurs’ experience stood him in good stead as the game entered the climax. When it looked as if the decider could go into the tie-breaker, the tall and lanky South Australian held it that bit tight and Mankad, serving to stay in the match, fell in quick time. The story was very much the same in the case of Bopanna too. In both the sets, the 22-year old failed at the crunch while the 147th ranked Draper put his foot down when it mattered. For someone playing his first Davis Cup match, Bopanna showed no fear of the big stage. His aggression was a contrast to Mankad’s nice-guy character, and he showed it repeatedly as he retrieved himself from 15-40 situations a couple of times with strong serves. But Draper always had an answer to whatever Bopanna came up with. In the finishing stages, he ruthlessly moved ahead of the Indian without giving any elbow room. Adelaide has shown that India lacks a quality singles player who could take them past the qualifying stage and into the World Group. This is the third time they are losing a qualifying tie, after being defeated by Sweden in 2000 and the USA in 2001. That gave the home side an insurmountable 3-1 lead and set up a clash in the final against France who beat the US in the other semifinal in Paris. Argentine captain Alejandro Gattiger gambled by replacing his No 1 player Gaston Gaudio with Nalbandian, who reached the singles final at Wimbledon this year. After battling each other for nearly two hours and splitting the first two tie-breakers, Safin, using his powerful serve and return, broke Nalbandian three times to wrap-up the third set 6-0 in just 28 minutes. In the fourth, the former US Open champion forced a decisive break in the eight game to take a 5-3 lead, then held serve to clinch the match and the tie on his fourth opportunity. The victory put Russia into the final for the third time in eight years. Nalbandian and Lukas Arnold brought Argentina back into the three-day tie by outlasting Safin and Yevgeny Kafelnikov in the longest doubles match in Davis Cup history — six hours 20 minutes Yesterday. He was summoned to attend the trials for the coming Asian Games at Pusan. Fighting fit, he reportedly performed exceedingly well at the selection trials. But his name did not appear in the team announced by the Indian Hockey Federation. So much so that no one from the IHF had the basic courtesy to tell him that he had not been “selected”. Baljit had earlier stayed away from two camps, including the one for the recently concluded Champions Trophy on the plea that he was not 100 per cent fit. The treatment meted out to Baljit Singh Dhillon is nothing new. Name any player of substance of yesteryear who did not receive the same treatment from the IHF. Any number of examples, including those of Jude Felix, Mukesh Kumar, Asish Balal and Jagbir Singh, are on everybody’s finger tips. There are no two opinions that it is the prerogative of either the selection committee or the Indian Hockey Federation to select or not to select a particular player in the team in the national interest. The secretary of the Indian Hockey Federation, Mr K. Jothikumaran, when contacted on the phone, said: “Baljit Singh Dhillon was left out on fitness grounds. There is no doubt that game wise, he is an excellent player. But Asian Games is a tough tournament. And the coaches felt that his fitness level was still not up to the mark. “In fact we had called Mukesh Kumar, Sameer Dad and Baljit Dhillon. Both Sameer Dad and Baljit Dhillon came to join the development team. There were matches organised between the development team and the main team. We mainly went by the recommendations of the coaches of the main team. It does not mean the end of the road for Baljit. If he improves his fitness, he should be able to walk back into the national team,” added Mr Jothikumaran. But it is the manner in which some of the senior and accomplished players, who dedicated their youth to the nation, are treated before being unceremoniously given a kick in the back that evokes condemnation from every section. “We have neither condemned him nor humiliated him. If the coach does not find him fit enough to take the rigours of a tough tournament like Asian Games, how can we be blamed for it. And without giving him a trial, how can we find about his fitness,” said the IHF secretary. But in the case of Baljit Singh Dhillon, he had stayed away from national camps because of his fitness. This time after he worked hard and reached a level which made him believe that he could wrest his place back in the team, he joined the national camp. His fitness was neither judged or checked by any fitness expert nor was he given any special fitness test. In case the IHF or its selection committee in their wisdom considered that he was “already over the hill” or “not fit enough to be member of the national team for the Pusan Asian Games”, he should have been advised so before the start of the selection trials so that he could have left the camp on one pretext or the other in an honourable way. But this was not done. He went through the grill of the trials and then was reportedly not even told the reason for dropping him from the squad. Indian hockey has been full of such examples, starting from the days when Mr Ashwini Kumar was the president and he had problems with the then penalty corner specialist Prithipal Singh. Prithipal Singh got into the national team more than once on public pressure and demand after being found “unfit” by the official selection committees. The selection of the team for the 1964 Olympic Games is an example. It happened with another stalwart of Indian hockey, Surjit Singh, when Mr Inder Mohan Mahajan was the president. It happened with Rajinder Singh Senior, now the chief coach of the national team. It happened with Surinder Singh Sodhi, Mohammed Shahid, Pargat Singh and many more who faced this “humiliation” of being called to the trials and then shown the “door” in a pre-planned manner. Asserting this here today, the coach of the Busan- bound hockey team, Narinder Singh Sodhi, who was in the city on a day’s visit to call on his sister who underwent a surgery, said reports on dissensions in the team were baseless. “The players are united and the best available talent has been picked to meet the challenge. No team can be taken lightly. Except for Hong Kong whom India meet in the opener on September 30, all other teams can pose a tough challenge but the Indian team, after the satisfactory outing in the Champions Trophy at Cologne in Germany is capable of taking on any team. A lot of effort has gone into removing the shortcomings noticed during the Champions Trophy. In the preparatory camp for the Asian Games, we laid emphasis on man-to-man marking, checking wrong passes, and controlling the pace. We will also need luck at Busan,” said Sodhi, who was also associated with the victorious junior World Cup team along with the present chief coach, Rajinder Singh. Sodhi also praised the efforts put in by Sampat Kumar in ironing out the grey areas in the squad. “We have also tried to improve upon penalty corner conversion and besides Jugraj and skipper Dilip Tirkey, full back Kanwalpreet is also shaping up well with drag flicks. We have also tried variations and hope these work out in the Asian Games,” he said. Referring to the controversial statement of the veteran Dhanraj Pillay, Sodhi said things had been sorted out and the Indian Hockey Federation chief, Mr KPS Gill, had had a talk with the Olympian on the issue. “Rest assured, we are united as a team”. On the exclusion of former skipper and Olympian Baljit Singh Dhillon from the squad, Sodhi said his fitness was not up to the desired level. However, he was given an opportunity to prove his fitness and it was only after the trials that he was excluded, the coach added. While Special Security Bureau carved out an authoritative 4-2 win over the young Shivalik Academy, Central Industrial Security Force faced stiff resistance from Punjab and Sind Bank Academy before prevailing over the rivals 3-2. The highlight of the SSB-Shivalik Academy tie was a fine hat-trick by H. Surchandra of SSB who scored twice in the first half. It was in the eighth minute that Surchandra opened the account for his team with a field goal. Four minutes before the breather, Surchandra scored another field goal to make it 2-0. Shivalik Academy came back strongly in the second half and a minute after resumption, reduced the margin through Jatinder Singh following a short corner. However, SSB continued to hold the upper hand and added to the rivals’ misery with another field goal by Surchandra, who completed his hattrick in the 52nd minute. In the 60th minute, KSH Shyamba made it 4-1 in favour of SSB following a penalty corner. With hardly three minutes to go for the long hooter, Shivalik Academy managed to score a field goal through Sarwan to salvage some prestige. In the second match, CISF went into arrears rather early, as PSB Academy’s Rajwinder Singh found the target in a goalmouth melee fllowing a short corner. CISF could have restored parity soon after but Cyril Ekka only managed to scoop the ball high over the crosspiece following a penalty corner push by skipper SK Kiro. However, they did not have to wait long as a penalty stroke awarded by umpire Rajinder Gandhi saw Cyril Ekka pushing the ball towards the left of the PSB Academy goalkeeper to restore parity. Three minutes from the lemon break, CISF’s Parteek Kumar made it 2-1 putting the academy lads on the defensive. In the second half,a fast counter-attack by PSB Academy was utilised to the hilt by Pardeep Kumar, who provided the finishing touches to a move initiated by Rajwinder down the centre (2-2). The match winner came in the 54th minute when, off a short corner, CISF’s Parteek Kumar found the target with a direct hit (3-2). Monday’s fixtures: Ropar Hawks v Shajahanpur XI — 1 pm; Western Railway v Post and Telegraph — 2.30 pm; Chandigarh XI v Air-India Academy — 4 pm. In a well-contested semifinal match played here today BSF ousted BEG Roorkee by 5-4. In the first half of the match no team could score any goal. However, in the second half BSF got a penalty stroke in the 43rd minute of play and its left-in Devinder Kumar scored. In the 48th minute. Kirpal Singh, left-fullback, converted another goal through penalty corner. However, BEG Roorkee weaved attacks on BSF citadel and equalised scoring in the 56th and 58th minutes of play. 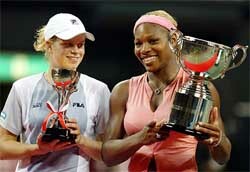 Later in the penalty strokes BSF and BEG scored three and two strokes respectively. In the other semifinal match Indian Air Force Delhi beat Signals Jalandhar by 5-3. The city giants were well served by a razor-sharp attack manned by the nimble-footed Baichung Bhutia and Jose Barreto, who were constantly fed by the hardworking medios at the opening round second leg match at the Salt Lake stadium. Bhutia struck a brace, while Jose Barreto, George Ekeh and Jaynata Sen chipped in with one apiece as the Lankans seemed in deep waters throughout the 90-minute exchange, failing to negotiate the slushy surface on a rain-fed day. The visitors’ only goal was scored by Sanjaya Kumara. The local outfit, who won the first leg tie in Colombo 2-0, took control from the outset and raced to a 4-1 lead at the breather. Earlier, in the semifinals (men), Madhya Pradesh pipped Rajasthan 15-5, 15-7 while Delhi had to fight to outclass holders, Bihar. Delhi men wrapped up the first set 15-9 but went down fighting in the second game 12-15. In the third set, Delhi players put their acts together to win it 15-13 to set up the title clash with Madhya Pradesh. In the women’s section (semifinals), holders Bihar scored a convincing victory against Delhi 15-3, 15-8 while West Bengal proved too good for Madhya Pradesh, whom they defeated 15-7, 15-10. In the sub-junior category, Madhya Pradesh beat Delhi 15-3, 15-1 to bag the title in the boys section while in the girls section, Bihar recorded an easy victory over Madhya Pradesh 15-1, 15-4 to lift the trophy. In the semifinals (boys), Madhya Pradesh overcame a spirited fight put up by Bihar 16-14, 15-11 while Delhi outplayed Punjab 17-16, 15-13. In the girls section, Madhya Pradesh beat Uttaranchal 15-4, 15-6 while Bihar overcame Uttar Pradesh 15-13, 15-13. In the senior category, Gurpreet Kaur and Jatinder Singh of DAV School, Police Lines, were declared the best athletes among girls and boys, respectively, while Prabhjeet Kaur of DAV School, Police Lines Jalandhar and Munish of DAV School, DMS (Main) Jalandhar were the best among junior girls and boys, respectively. (Junior boys): 1. 100 x4 mrelay- 1. DAV School, Police Lines, Jalandhar, 2. DAV School, Atta, Goraya, 3. DAV School, LJN, Jalandhar; 1500 m: 1. Gurvinder (DAV School, Mikandpur), 2. Kamaljeet (DAV School, Dasuya), 3. Rajnish (DAV School, LJN, Jalandhar); 400 m: 1. Munish (DAV school, DMS, Jalandhar), 2. Uttam (DAV School, Atta, Goraya), 3. Robin Singh (DAV School, Patiala). Girls: 100 x4m relay- 1. DAV School, Police Lines, Jalandhar, 2. DAV School, LJN, Jalandhar, 3. DAV School, Bhikhiwind; 1500 m: 1. Shabnam (DAV School, Police Lines, Jalandhar, 2. Pawan (DAV School, Police Lines, Jalandhar), 3. Yashpreet (DAV School, Dasuya)	200m: 1. Prabhjot (DAV School, Police Lines, Jalandhar), 2. Gurvinder (DAV School, Phillaur), 3. Netu Bala (DAV School, LJN, Jalandhar).